There is no easier way to cook asparagus than to roast it—you’re just putting it in the oven and letting it do its thing. Grilling is a close second in terms of ease, but you need to turn it and watch the flame, so roasting is, no question, the easier option. Roasting also tames the grassier herbal flavor of asparagus and brings out a deeper, earthier, more savory edge. 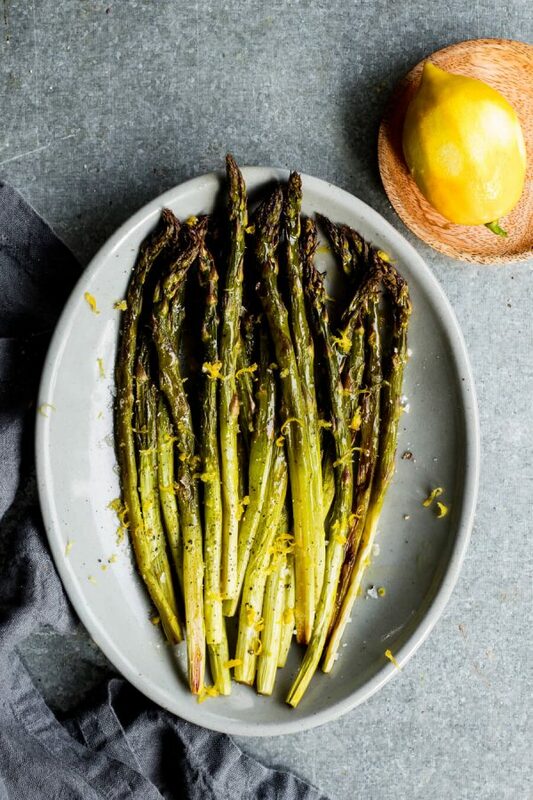 See how to make utterly simple roasted asparagus below—then scroll down to find lots of ways to jazz it up. ...lemon zest, fresh ginger, aioli, chile, hollandaise—this recipe is a canvas for all kinds of flavors. Heat an oven to 400°F. While the oven heats, prepare the asparagus: you can either break off the tough ends where they naturally snap by grabbing both ends of an asparagus spear and bending it until it breaks; or, for a more elegant presentation, trim off about 1/2 inch from the end of each spear and use a vegetable peeler to peel about halfway up the spear. Arrange the asparagus spears in a single layer on a baking sheet or in a roasting pan. Whatever vessel you choose, make sure the asparagus isn’t crowded so there’s plenty of room for the hot air to circulate and brown the asparagus. Drizzle the asparagus with the oil, toss to coat it, and spread the asparagus back into a single layer. Sprinkle with the salt and bake until the asparagus is tender and starting to brown on its tips, about 15 minutes. Serve hot, warm, or at room temperature with a spritz of lemon juice or any of the other optional toppings. 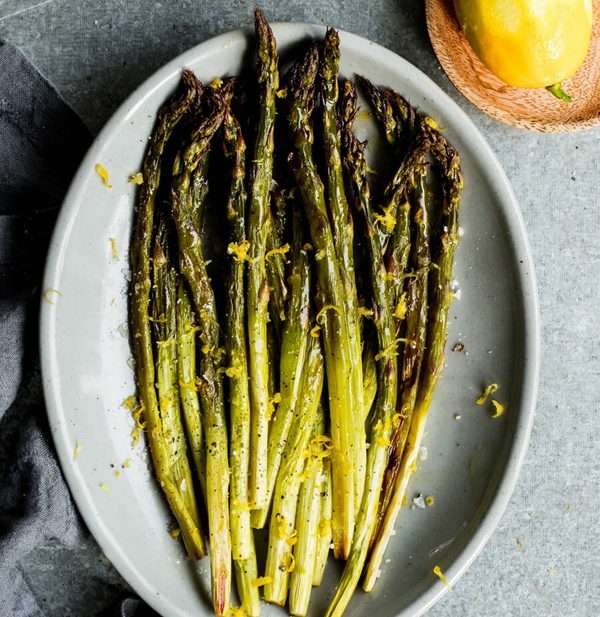 Lemon: grate some lemon zest over the asparagus, cut the lemon into wedges to spritz with fresh lemon juice. Butter & Herbs: top with a pat or two of butter and scatter on a handful of chopped fresh herbs (parsley, mint, tarragon, and dill are all good choices). Rouille: add 1/2 teaspoon cayenne along with the mustard to the aioli. Hard Egg: Put 1 to 2 eggs in a pan of boiling water, cook for 9 minutes, cool with cold water, peel, and finely grate over the asparagus. Soft Egg: put 1 egg per person in a pan of boiling water, cook for 6 minutes, cool with cold water, peel, put 1 egg on each serving of asparagus, sprinkling with salt to taste (a sprinkle of Aleppo pepper can be good too!). Green Garlic: finely chop ½ pound green garlic, in a frying pan over medium-high heat, cook the green garlic with 1 tablespoon olive oil until tender, about 5 minutes; in a blender or food processor, whirl the softened green garlic, 1/4 cup each pine nuts, extra-virgin olive oil, and grated pecorino cheese to form a paste; add salt to taste before spooning over the asparagus.